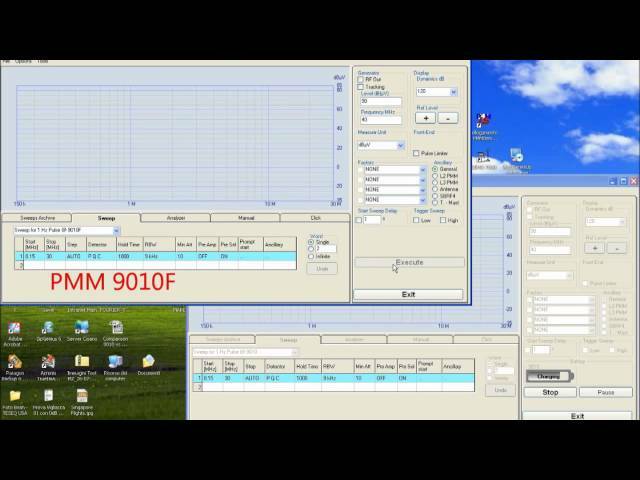 The 9010F is an EMI receiver based on an analog-digital conversion and an advanced data processing using the FFT spectrum frequency analysis in full compliance with all the tests required in CISPR 16-1- 1. The FFT technology allows for real-time data, this excludes the loss of data within the analyzed band. The 9010F is also equipped with all the filters and the detectors in full accordance with the law with the CISPR and MIL-STD standards. The frequency range of the 9010F can be expanded up to 18 GHz thanks to the use of external units 9030, 9060 and 9180. RF input Zin 50 Ω, BNC fem. Stand alone & measure functions Marker, marker peak, marker to center, highest peaks, move peak to Analyzer & Manual modes. Store -load: up to 11 traces (sweep mode), two panels, 4 conversion factors. Built-in limits: CISPR 11, 14, 22. RF output Tracking (manual mode) & CW generator, Zout 50 Ω,BNC fem.